I am using 1.5.7 on Ubuntu 18.04. I am able to sync my google drive folder with a local folder but there are files with () on their name is being created for google docs files. Please see the following image. Could you let me know what you did prior to the duplication? If not, then what you were doing when you noticed the duplication. 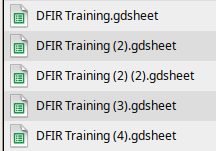 Are the files that were duplicated have different versions? Or are they identical? Is that the only file affected or are there more?